Two long term "big prizes" in the cryptocurrency world are (i) the primary store of value token and (ii) a payments token. Programable money has the potential of a multi-trillion dollar market cap, unlike most every other crypto market or use case. The top contender to date for digital value store is bitcoin. Bitcoin has a number of network effects due to its early market position and adoption. However, bitcoin has also suffered from split ecosystem governance, slow development iteration cycles, and fork driven branding confusion. There is an open question as to whether bitcoin ends up as the social networking equivalent of Facebook (dominant player), Twitter (could have been 10 times bigger, but an OK outcome), or MySpace (once dominant, now total flameout) of cryptocurrencies. Brand confusion in Bitcoin world likely to get worse. Bitcoin has many destabilizing forces at work. The most likely challenger today to Bitcoin as the dominant cryptocurrency for the money use case is Ethereum. Originally launched as a decentralized computer, Ethereum is also being used a store of value, as well as an investment vehicle via ERC20 tokens. It is now at >50% of bitcoin's market capitalization. Given the reflexivity of digital assets like cryptocurrencies, if Ethereum's market cap surpasses that of bitcoin for a long enough period investors may bail on bitcoin en mass and move to Ethereum as the winning token. Ethereum is now in shooting range of bitcoin. On a fully diluted/issued basis, Ethereum's market cap is closer to 2/3 that of bitcoin. This makes Ethereum a "must have" holding for every institutional investor and a must list for every exchange. Similarly, Ethereum will be the second cryptocurrency for which derivatives will be issued. These features will create and bolster the existing network effect around Ethereum. If Ethereum surpasses bitcoin's market cap for long enough and there is a flight of investors to Ethereum, it is possible bitcoins' network effect could unravel. Network effects tend to unravel cataclysmically. In parallel, there may a big multi-coin rally at this point as the world will realize things are still up in the air and early days. Given its more accessible scripting language and focus on being a broader platform technology, Ethereum has seen significant adoption by the developer community as the crypto platform to use. This has led to CryptoKitties and other early signs of ways to use the protocol at scale. 3. Ethereum Has Multiple Use Cases Besides "Money"
For non-crypto investors the "value" of cryptocurrencies is often a point of contention. Investors may be used to valuing stocks or real estate based on future potential cash flows. Pure reflexivity ("It is valuable because society agrees it is valuable") is hard for non-crypto investors to accept even though they accept this argument for art and gold. Mainstream investors may be more likely to accept Ethereum as an investible asset due to its association with decentralized compute, as well as the fact its smart contracts power financial services like ICOs. By having specific uses outside of value store, Ethereum's inherent worth increases in the eyes of people who collectively control trillions of dollars of investable assets. ERC20 token use for ICOs creates additional use of Ethereum and additional developer and exchange adoption. This increases the potential for Ethereum as a value store or eventual crypto reserve currency. Ethereum continues to add features and iterate. Both bitcoin and Ethereum have scalability and performance issues, with bitcoin stuck at ~7 transactions per second. 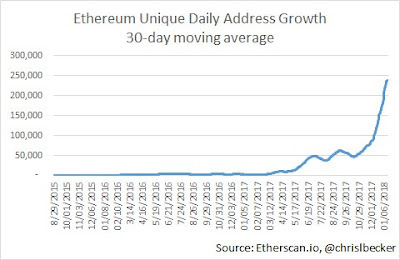 However, the Ethereum developer community is actively working on scaling (although its own performance still leave a lot of room for improvement). Ethereum is focused on scalability, proof of stake, and other innovations that will maintain its relevance. bitcoin risks idling away its lead, although some projects like Lightning are focused on scalable, fast transactions. A big portion of Ethereum's ability to iterate is driven by having an engaged founder in Vitalik Buterin, and early expectation setting on that Ethereum will be a multi-year evolving project. Bitcoin momentum. Bitcoin still has the brand and network effects that should allow it to win if it acts now. It is always possible the bitcoin community will realize how vulnerable it is becoming and act. There are some good examples of the strong ecosystem around Bitcoin like Lightning, as well as more recent approaches such as Bulletproofs. Cross chain interoperability. There are a number of approaches to this, but imagine a world where people can store value in bitcoin but still interact in a low-friction way with Ethereum's smart contract world. A new smart contracts platform or other innovative protocol may arise and subsume it. Dfinity, Tezos, Kadena and others are working on alternatives to Ethereum. Ethereum is unable to execute. If Ethereum was a company, it would have dozens of developers managed in a structured way to execute on its roadmap. It is possible that Ethereum can make fast progress via its current team and structure as well as bounties or rewards for external contributions. However, there may be a threat in a centralized team building a decentralized protocol launching and iterating faster. This is part of the premise of Dfinity and Tezos. You could also have a centralized team build a more centralized protocol - for example Telegram and its new TON token. The attack surface area of "global compute" could end up being intractably large. We have still not seen many creative attacks on Ethereum of even many basic DDOS attacks. Ethereum has a "move fast and break things" mentality. It is always possible another competitor platform will arise just as Ethereum break's something a bit too strongly. Vitalik Buterin drops out of the Ethereum project. The non-nefarious version of this is he does so to become a scuba instructor in the tropics. In general, both bitcoin and Ethereum have a lot to offer the world. Bitcoin should have been able to maintain an unassailable position as the store of value cryptocurrency, and still has enormous momentum on its side. The value store use case is still bitcoin's to lose. Ethereum's progress (and market cap growth) over the years have strengthened its position and make it the most credible threat to bitcoin dominance today. Given how rapidly things are changing in the cryptocurrency world, it will be fascinating to see where things end up in 2019. Thanks to Lucas Ryan, Matt Huang, Fred Ehrsam for comments on this post. Prediction markets, VPNs, and even decentralized computers are all much smaller markets then money. One implicit assumption I am making is that there will be single dominant value store token. In reality, I think a more realistic scenario is that there may be (i) some geographic split on value store (China versus Western World is one scenario) , (ii) one "big" winner per geo and then a set of secondary coins that are 10-20% of the value of the big winner and (iii) there may exist large value store coins with specific features or use cases - e.g. a privacy token. These may overlap with (ii) and be secondary value stores of lessor but significant value. Some would argue that bitcoin's split governance is a feature and not a bug. For a value store token you may actually not want your digital asset to change that much over time. Split governance prevents rapid change. I got into a recent heated debate recently with an old school industrialist where he argued that art was valuable because you could put in on the wall and admire it. Therefore, a piece of art may be worth $100 million, despite being an old canvas and chipping paint. Of course he failed to mention that a fake knock off of the Mona Lisa has the same visual utility despite being worth a fraction of the price. To not accept art as a reflexive asset seems odd. Sean Parker once said that is MySpace had just fast followed everything Facebook did, MySpace would have won. We all know what happened to MySpace instead. There is of course, a scenario where both tokens thrive and between the two of them function as a collective basket of crypto used for value store. This strikes me as unlikely due to network effects but lots of possibilities of the future still exist.